Sea Wall to Oak Bluffs, oil on canvas, 24 x 36 inches. Frances McGuire is not your typical Vineyard landscape artist. McGuire’s speaking voice, like her painting voice, has a rich, tactile quality, and some words are spoken with such emphasis that it’s possible to believe you can touch them. “I sounded like this when I was a kid. I had to grow into my voice,” said McGuire, shaking her head. She’s comfortably forthcoming and moves through conversations in a non-linear fashion, like a time traveler, which she kind of is, often painting from photos she’s taken from as far back as the 1970s. 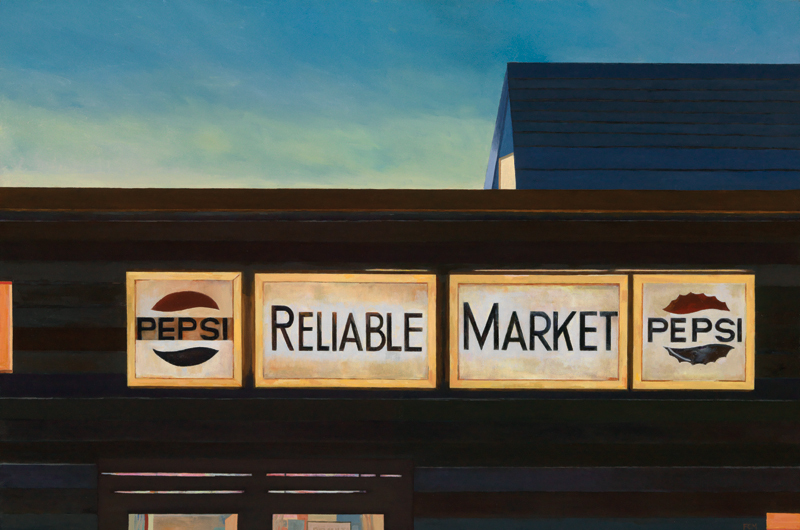 Reliable Market, oil on canvas, 18 x 24 inches. She inserts “okay?” not so much as a question but as a pause, allowing her words to catch up to her feelings, as well as an opportunity to pivot outwards, to confirm her listener is keeping apace and understands the import of what follows. Once affirmed, she rolls on, seamlessly, to her next point. In this moment: vibrant verbal snapshots of her adventures, most of which involved a bike, because after her parents’ divorce the family did not own a car. When McGuire wasn’t able to be outside, literally, she’d wish her way out – or in other worlds, “I’d pretend I was wandering the cornfields of Iowa, or I’d imagine winds from the Adirondacks making their way down from upstate, funneling between the buildings of the Manhattan skyline, and then into my open window. 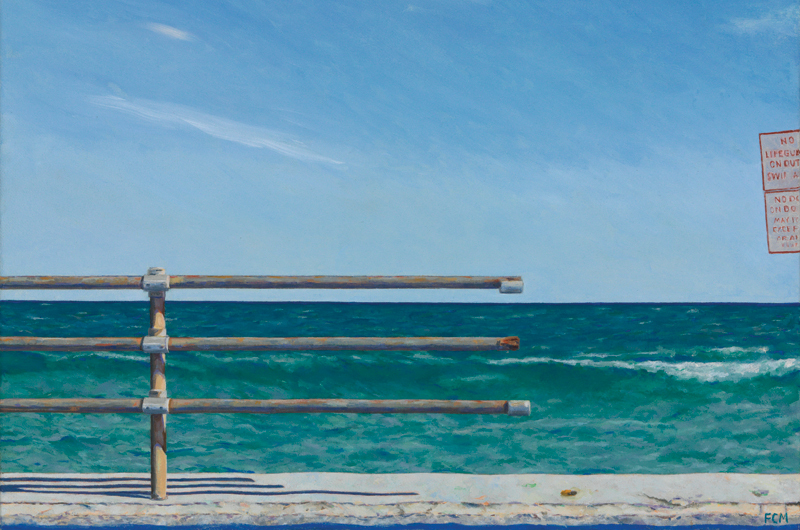 Oak Bluffs Pipe Rail Fence, oil on canvas, 12 x 16 inches. McGuire’s oil paintings, ranging in size from 8 x 8 to 40 x 46 inches, share a strong horizontality. “I’m always fighting for a straight line,” McGuire confessed. “I will wrestle a painting to death.” One feels the invisible grid beneath the surface onto which she layers color and shape and light to create feeling. Each painting is a palimpsest of emotion – but not necessarily narrative – expressed without judgment or expectation. The visual equivalent of, “I’m just saying.” The formality, or construction, of her compositions and the more traditional use of materials loosen to shards of fractured light and color for punctuation. What McGuire paints is all there is; what was is unseen, but not hidden because there’s nothing to hide. “I’m very into concrete Libby, alright?” asked McGuire, but it’s really a rhetorical question because her paintings are so transparently populated by the built materiality of a place – walls, buildings, and signage – or the space in between the brush and bramble of the natural landscape. In this way, one could even suggest that McGuire paints what she escapes to; that her preferred point of view is from the outside looking at, not in. But the feeling of her work speaks to a deep interior emotional landscape. “If there’s no emotional connection, I’m not interested,” she emphasized, without apology. Fast forward many years, when McGuire – haunted by the ghost of an ended long-term relationship – was physically separated from the Island itself, but not from the intensity of her feelings for it. She married a man she described as a doer; “He’s a guy who gets things done. Without him, none of this is possible,” she said, gesturing wide. “I mean, he managed the cleanup of Ground Zero.” They had a son, now in college, and spent their summers hopscotching between the Jersey Shore, Cape Cod, and other destinations – everywhere but the Vineyard. All the while, McGuire was documenting, in photographs and paintings, what aesthetically moved her. 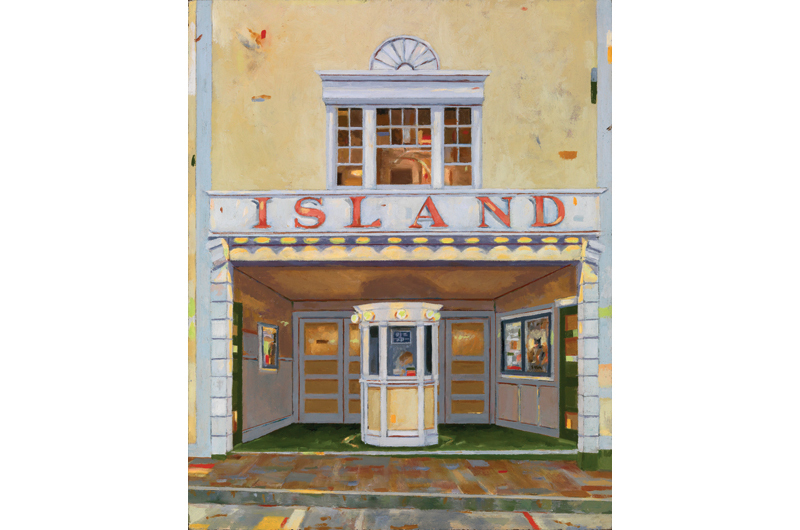 Island Theater Kiosk, oil on panel, 11 x 14 inches. she’d taken with her Pentax K1000 in the 1970s – that served to bridge her past and present tenures on the Island. Seawall paintings gave way to other views of Oak Bluffs: the concrete road posts along East Chop, the pipe railings along the beach, and, because of her affinity for signage integrated with architecture, she painted detailed portraits of the typographical-rich facades of Our Market, Reliable Market, and the landmark Island and Strand Theatres, among others. 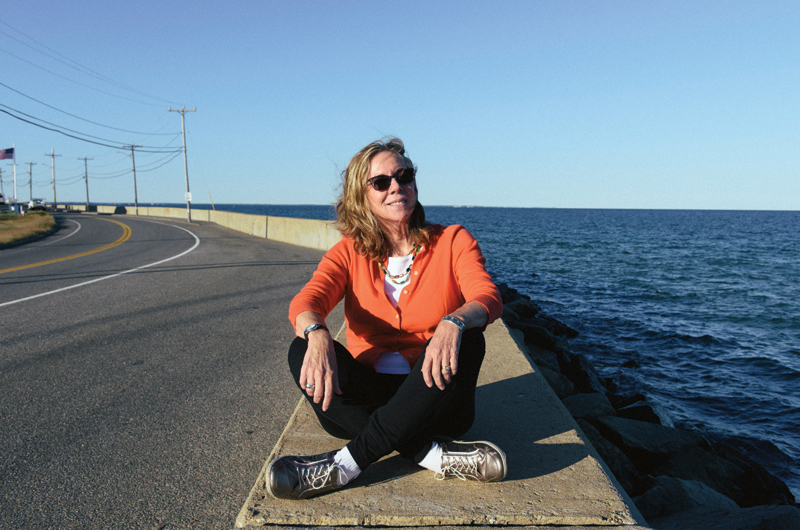 This past winter and spring, McGuire has been working at a larger scale, for her, having just completed a mural for The Ritz in Oak Bluffs, as well as a private commission for Gretchen and Paul Massey. The latter, measuring 36 x 48 inches, is a painting of a room from their house on East Chop that was demolished to make way for their new home, in which this piece will hang. The room is spare, unpretentious, and masterfully depicted. 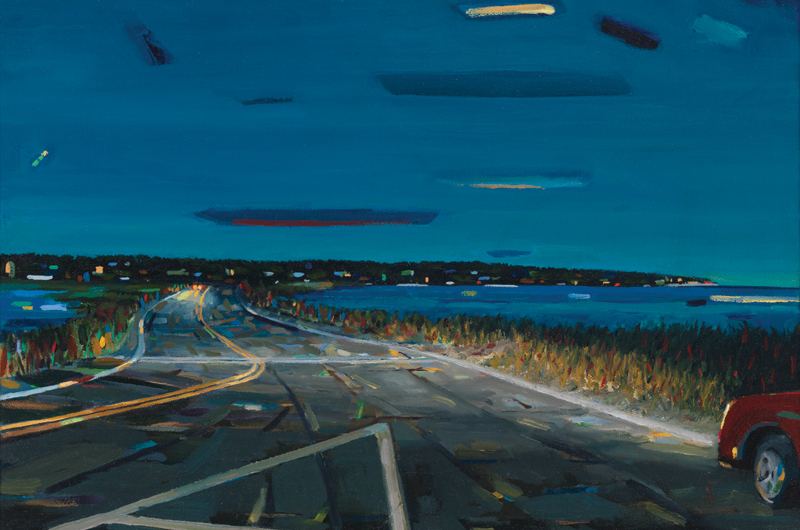 Here, too, McGuire, as painter and documentarian, brought laser-focused execution and distillation of emotion to capture a finely articulated moment in history that allows the experiencer to experience the sense of place. In this way, art meets fact to become artifact. State Beach Night, oil on canvas, 12 x 16 inches. I love your work! I, too, am a graduate of Art and Design class of '64. Just helped celebrate its 80th anniversary! I miss the old Wesley...and I like McGuire's paintings. I worked for Paul Chase in the kitchen of the Wesley House during the late 60's. His father George, was the owner. Great summers!!!!! Lived in the "Crews Nest" on the top floor of the building to the right of the main house. Had open views of the harbor.